Dear Gabacho: Your question assumes there’s a need to secure borders, when really we just need to legalize drugs and people, and our “problem” vanishes; after that, we can concentrate on preventing actual threats from entering this country instead of perceived ones. But I’ll play your juego: How would I secure American borders? Easy: American jobs for Americans only. Create an insular, xenophobic economy that keeps away all foreign labor and wants nothing to do with foreign investors. In other words, adopt the Mexican model—and look how far that got them. Dear Gabacho: Your friend is proof of how tontos Republicans are when it comes to the issue of immigration. If migrating legally to the United States was as easy as your amiga insists, do you think Mexicans would pay thousands of dollars in smuggling fees and subject themselves to the terrorizing whims of coyotes when the legal way sets you back, after attorney fees and everything, a couple thousand dollars? If illegal immigrants didn’t want to pay taxes, then why do so many assume fake Social Security numbers that ensures payroll and Social Security taxes get pulled, the latter of which they’ll never get back? 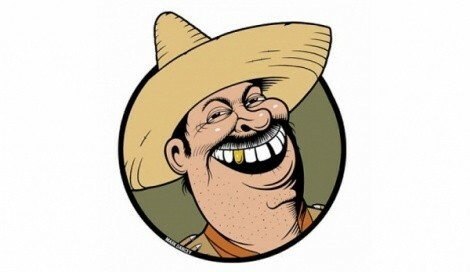 If illegal Mexis wanted to live high on the government queso, then why do you see so many of them selling flowers and strawberries on street corners? Tell your amiga that legal immigration takes years, years that poor people can’t afford to waste in poverty when a risky trip will do the trick, and that she needs to become libertarian and learn true conservative principles instead of the snake-oil pendejadas currently offered by her party. GOOD MEXICAN OF THE WEEK: Los Tigres del Norte need no real introduction, but this one’s for the gabachos: Imagine the Beatles combined with the Rolling Stones, mix in some Clash and Bill Monroe, and you still won’t come close to describing the influence, innovative technique and all-around talent these masters of the conjunto norteño genre (the Mexican music with accordions, not the one with tubas) have had on Mexican regional music for over 40 years. Their latest album, MTV Unplugged: Los Tigres del Norte & Friends, has the group performing some of their masterpieces and even features a duet with Rage Against the Machine frontman Zack de la Rocha. Do yourself a favor and buy this album as a primer—then work backwards through a catalogue that would make Bob Dylan seem as prolific as Blind Faith. Ask the Mexican at themexican@askamexican.net, Facebook.com/GArellano, YouTube.com/AskAMexicano, find him on Twitter, or write via snail mail at: Gustavo Arellano, P.O. Box 1433, Anaheim, CA 92815-1433!